Plus, a new location for Cholita Linda and a farewell (for now) to Bun Mam Soc Trang. William Lue(center) and the chefs of Grocery Cafe. Hidden away in an East Oakland residential neighborhood, Grocery Cafe (2248 10th Ave., Oakland) is already a one-of-a-kind restaurant. Regulars at this tiny Burmese cafe sit on repurposed church pews while feasting on tamarind-spiked deep-fried samusas, steaming bowls of catfish chowder, and the most potent fermented tea leaf salad in town. And if chef-owner William Lue has his way, customers will soon be able to enjoy one more hard-to-find specialty: Burmese-style barbecue. To help make that a reality, Lue recently spearheaded a successful $10,000 Kiva microloan campaign. The money will pay for the construction of an outdoor grilling/dining area in front of the restaurant that will have room to seat nineteen diners. Lue said his tentative plan is to purchase a rotisserie grill equipped with a spit, which he hopes to use to host a weekly suckling pig roast once the weather warms up. In terms of what Burmese barbecue actually entails, think more along the lines of grilled meat skewers rather than the slow-smoked meats of the American South. Lue explained that the meats will be marinated with aromatics such as cilantro, shallots, lemongrass, and moringa. Tamarind is used as a souring agent instead of vinegar. And Lue said that if customers are receptive to it, he hopes to grill many of the innards and other offal cuts that are ubiquitous at Burmese street stalls — the snouts, gizzards, intestines, and such. Lue said the construction of the outdoor barbecue area, which he hopes will be complete by April, is part of recent efforts to expand the Burmese offerings at Grocery Cafe. In a similar street food vein, he plans to designate Fridays as "Fry Days," during which the restaurant will serve various fried street snacks, including one that Lue likened to Burmese-style ballpark garlic fries. On the other end of the spectrum, the restaurant also recently started serving formal Burmese banquets, available with at least one day's notice for groups of eight diners or more. 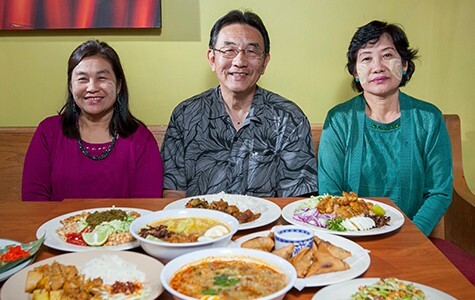 For roughly $25 a person, diners can share eight family-style dishes, including several that aren't on the regular menu — for instance, a Burmese seafood "cioppino." Banquet customers can bring their own beer or wine with no corkage fee, and sometimes, if Lue is in a particularly good mood, he'll even pick up his accordion and play a few tunes. 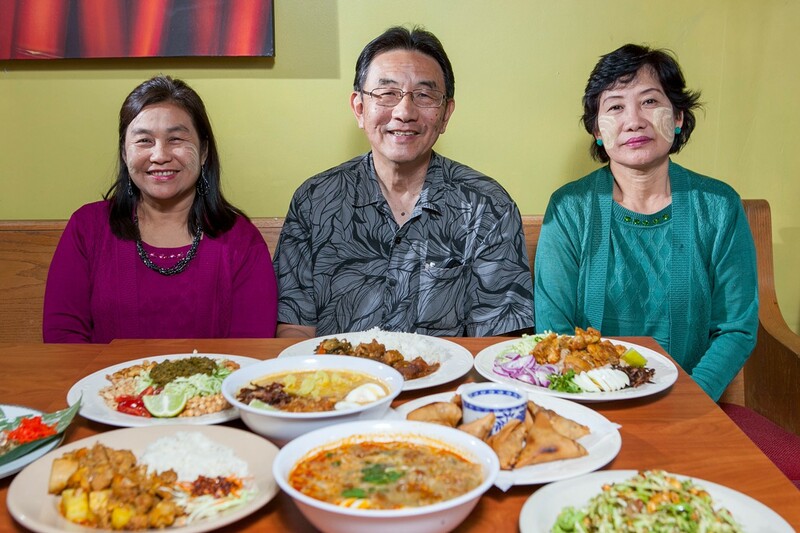 To our knowledge, no other Burmese restaurant in the Bay Area regularly offers this kind of banquet. East Bay fans of Baja-style fried fish tacos won't find a much better version than the one served at Cholita Linda's farmers' market stands and its popular Telegraph Avenue restaurant. Now, you can add another brick-and-mortar location to the list: The owners of Cholita Linda plan to open their second branch in the old Burrito Shop location at 3256 Lakeshore Avenue. That spot was the subject of some controversy last fall when The Burrito Shop's owners, who occupied the location for nearly thirty years, were unable to persuade the landlord to renew their lease. At the time, the prevailing rumor was that the Peet's next door was planning to expand into the space. That never came to fruition, and, as it turns out, Lakeshore will be home to a Mexican restaurant after all — though it will be fish tacos, not burritos, that will be the specialty of the house. Co-owner Murat Sozeri said the basic setup of the restaurant will be the same as their Telegraph Avenue location, and that they plan to make at least one notable addition to the menu. Vanessa Chavez, the chef (and Sozeri's wife), had been wanting to add Peruvian-style rotisserie chicken — aka pollo a la brasa — to the menu for quite some time, but decided that operating a rotisserie wasn't feasible with their kitchen setup. Instead, both of the Cholita Linda locations will add a grilled chicken plate and grilled chicken sandwich to the menu, prepared using the same flavors as a traditional pollo a la brasa, but without the rotisserie. If all goes according to plan, the new Cholita Linda will open in the late summer or early fall. Sad news for fans of hard-to-find Vietnamese noodle soups: Bun Mam Soc Trang (1326 E. 18th St., Oakland), which, for my money, was the best Vietnamese restaurant in Oakland, has closed. Co-owner Hien Tran, who ran the popular noodle shop, along with her mother Dieu Tran, said Bun Mam Soc Trang's last day of business was December 21. Tran's initial plan had been to take a brief year-end vacation — but then, without warning, her landlord delivered the unexpected news that the restaurant's lease wouldn't be renewed when it expired at the end of January. According to Tran, the landlord said the restaurant attracted too many customers for such a small space. Regardless, the Trans ultimately decided it wouldn't make sense to reopen for only a few weeks. Tran hopes to eventually reopen at a different East Bay location, but she said that, like many small business owners, she has found the current commercial real estate market to be daunting. Customers can visit BunMamSocTrang.com — for now just a placeholder website — for updates.